Americans were thrilled today to embrace a period of renewed austerity, jettisoning credit in favor of savings, rejecting needless extravagance in exchange for thrifty practicality, and they started with the American sandwich. 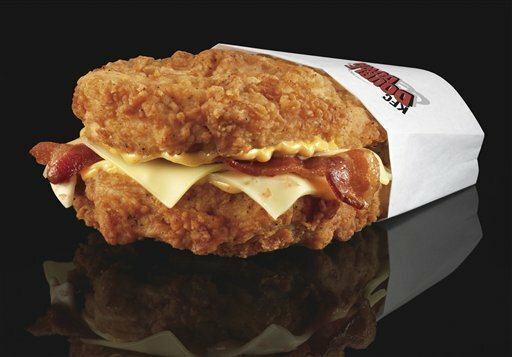 Early this morning Americans threw away their buns and took up the KFC "Double Down" sandwich in signs that those who were making less bread were going to simply do without. The "Double Down" -- named, appropriately, for a gambling procedure in which one dramatically takes on twice as much risk -- is a "sandwich" where the slices of bread have been replaced by two chicken cutlets, between which are pillowed slices of tasty American cheese, crispy bacon, and zesty but strangely yellow mayonnaise. "It is to die for," said one food critic. "I'm not kidding." He immediately collapsed and was carried away. Americans waxed rhapsodic about the symbol of America's new look-reality-in-the-face back-to-basics lifestyle. "It is hard to believe that they made something so blissfully tasty without hardly any carbs," said Diana Sugartester of Indiana. "Dieting has never felt so good," agreed fellow foodie Greg Shlub, a cosmetic surgeon with a mysterious limp. "This just shows," said Senator Joe Lieberman, with his trademark wisdom, "that Americans can learn to get by with less."